This page demonstrates an example Inline XBRL (or iXBRL) report. The example is based on an extract from the Global Legal Entity Identifier Foundation’s (GLEIF) 2017 annual report. 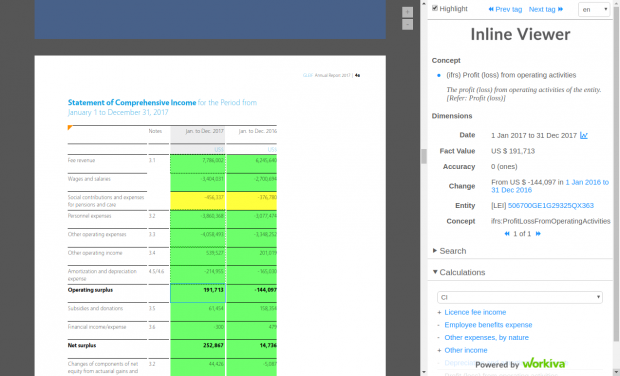 The report is shown using a pre-release version of a new iXBRL viewer tool. A free, production version of this tool is expected to be released by the end of 2018. Please note that this sample is provided as a technology demonstration only. XBRL International would like to acknowledge the assistance of GLEIF, Merrill Corporation and Workiva in preparing this sample.